KCTC Launches a Jogger Stroller Loan Program! Lou Joline saw a “like new” Xterra Jogger Stroller at a garage sale last week and bought it because he knew someone would love to have it! Lou’s idea was brilliant since there are many new moms who stop running because they don’t have babysitting or a stroller they can jog with. And that is how the KCTC Jogger Stroller Loan Program was launched! 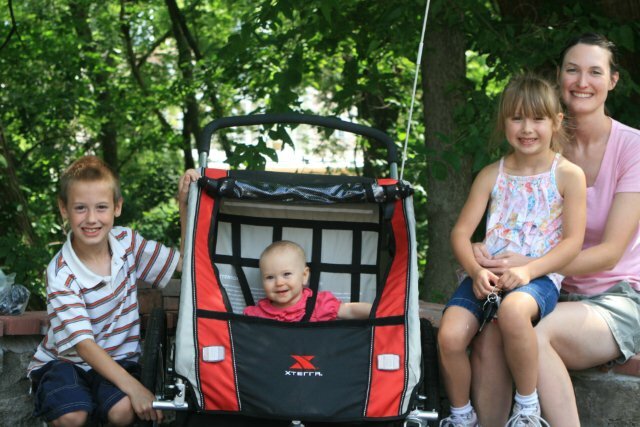 Christie Polley and family just picked up the KCTC jogger/stroller. Christie will be able to keep the stroller for one year but I suspect by that time we will have an entire fleet of strollers and she can keep it until her baby doesn’t want to ride any longer. 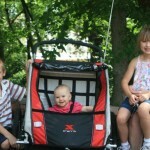 A friend just told me she would sell KCTC her Reebok stroller for $40.00 so another mom will be able to use it. We are looking for more strollers so let us know if you have one available.